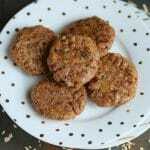 These Nut Butter Cookies are a perfect healthy treat; they’re grain-free with only 5 ingredients, and can be made in 15 minutes! Sweet treats are part of my everyday routine, but I do make an effort to use ingredients that support my health. I used both almond and peanut butter in this recipe, but you could easily substitute cashew butter or tahini to make them paleo. The coconut flour helps them stick together, and the dates are the only sweetener. You’ll need a food processor to get everything nicely combined. I also used vanilla bean powder because I just love vanilla. I used a regular fork to make the little pattern on top. I saw someone do that on Instagram (sorry, I can’t remember who!) but I thought it was so cute and reminiscent of “real” peanut butter cookies. Guys, I know I promised I’d talk about my grain-free journey if you were interested. I got enough positivity responses that I thought I’d bring it up here. I’ve been seeing a functional medicine doctor who is a super big advocate of a primal/paleo approach for healing (here’s a good article about the problems with grains), which includes avoiding gluten as well as grains. While I’m not one to cut out whole categories of foods after my previous experience of going too far with that, this doc has encouraged me to experiment with eating fewer grains, all the while monitoring some nagging issues like joint pain and autoimmune antibody markers. I’m actually not going 100% grain-free and still enjoy “safer” grains like white rice and buckwheat a few times a week, but it’s been kind of fun to experiment more with some new-to-me products in the kitchen like coconut flour that I used in this recipe today. Incidentally, my doc also promotes a legume-free approach for autoimmune issues, but I had to sneak in a bit of peanut butter into these cookies. Peanuts are technically a legume and not a nut, but I’ll pretend to be ignorant on that point, ha ha. Does that shed some light on the grain-free trend that I’ve hopped on? 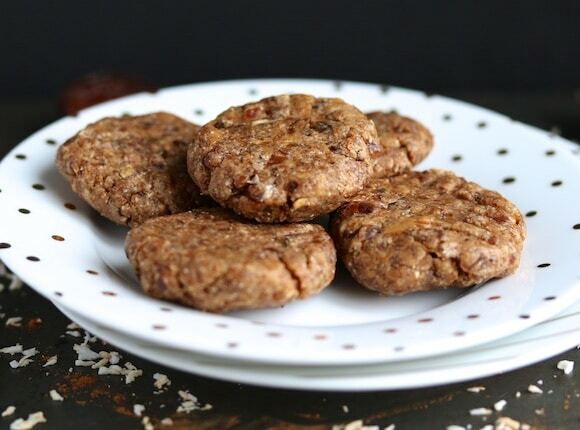 These grain-free treats take all of 15 minutes to make. 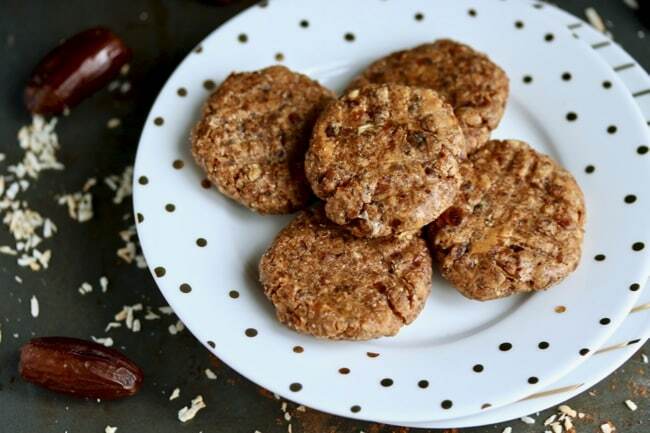 They are date-sweetened and a healthy cookie option. Combine the dates, almond butter, peanut butter, coconut flour, vanilla bean powder, and sea salt in the bowl of a food processor. Pulse on high until the ingredients are well combined. Pour the mixture into a mixing bowl and use your hands to form about 10 cookies. Press a fork into the top of each cookie to form a pattern. For the best texture, chill the cookies in the refrigerator at least 30 minutes before serving. Feel free to substitute cashew butter or tahini for the almond or peanut butter. I may have eaten all but two of these cookies last week before my husband asked if he could try them. I gave him the last two and he promptly asked for another batch. A good sign, I think! My kind of cookie! I stocked up on natural crunchy PB last night since it was on sale so need to go shopping for more ingredients. These will keep you fueled for sure and all the ingredients seem to digest well for me, which is usually the factor on what I eat for the day. Such a touchy stomach lately. I think one day last week I just ate oats–they are my safe food. Coconut flour is so good though. Thanks for the recipe! Thanks, Deb! Hoping your tummy feels better this week! Xo. Thanks for submitting! I made these yummy cookies and call them my “power cookies” for an excuse to eat them after work out. Then I call them “healthy cookies” as an excuse to eat them when I don’t work out. Ha! Ha ha, that’s great, Erin. I love how you re-name them based on your needs. XOXO! These are super easy! I love that they are only date sweetened – I can feel good about giving one to my little guys at home! So fun and they look like the perfect after-school snack for my son. He needs something that will fill him up but something I feel good about, and something that doesn’t require baking is awesome. Will have to try these! Oh I bet these are so chewy and delish! Love that they’re no bake, we’re almost in “to hot to use the oven” weather over here! Oh wow, I wish I could say it was warming up here in California, Cristina! We’re still getting rain and cold-ish weather. Enjoy your lovely spring! XO. I agree – I think we can all enjoy sweet treats so long as they are made with healthy ingredients. Love this recipe, looks so delicious. 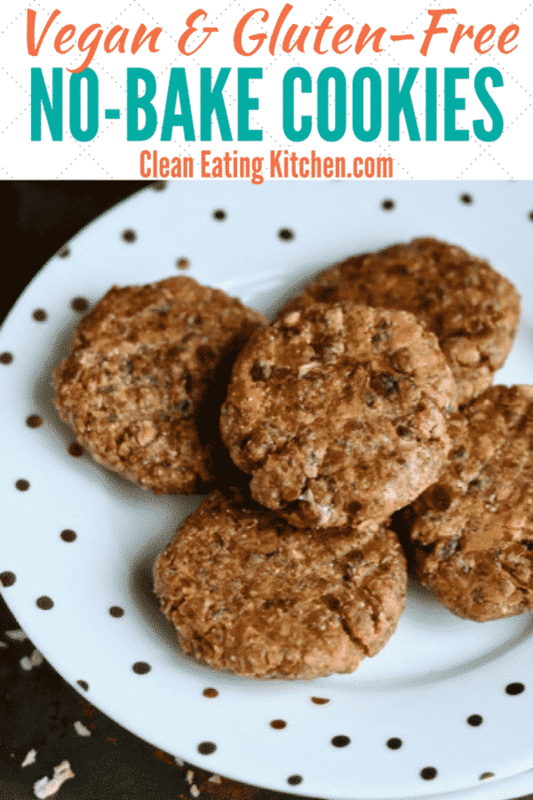 I love all kinds of no bake desserts because they’re so fast to make, and it’s an extra bonus these are date sweetened! Wow ! This recipe looks so simple and delicious ! Going to make these cookies the coming weekend ! Oh yay! That makes me so happy. Please let me know how they turn out for you! XO. I love that these are vegan & egg free for my vegan friends. I never have anything egg free for them, lol. Agh Carrie this speaks to my soul! Love nut butter and no bake?? Too easy. XOXO, Allison! Have a wonderful holiday weekend. Yes, definitely! I’m happy to hear you’re a date fan as well. 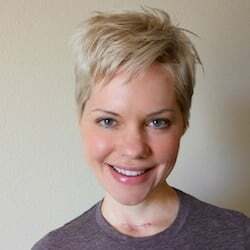 Have a great weekend, Jessica! XO. These look really good! And so easy. I love that you used just dates to sweeten them. And no bake!! Love how simple these sound! And no bake is so nice when it gets hot out. Right?! I love how you are already thinking ahead to warmer weather, Erin. I can’t wait for summer!!! XOXO. Oooh, I love vanilla bean powder, too! These cookies sound great. Hi Becky! I’m glad I’m not the only one! I feel like nobody knows about how awesome vanilla bean powder is. Have a great rest of your weekend! These sound delicious! I LOVE all of the dates in them, dates are one of my favorite things. I love the texture they add to cookies and other goodies. That’s a good point, Emily! Dates do give some nice texture to sweet treats. XO. Love these! I’m always looking for simple cookie recipes that can be thrown together super quick without a lot of ingredients, so this is perfect! Me too, Dana! I love having healthy sweet treats available. Have a great week! XO. What a lovely easy cookie recipe. I’m a PB fan too, yummy. These look like amazing cookies and something I want to try very soon. Yum! These sound absolutely lovely. I absolutely adore no bake recipes so I can still make amazing food in the hot summer months. There is NO doubt in my mind that many families across our community would absolutely adore and devour these cookies. Great job!